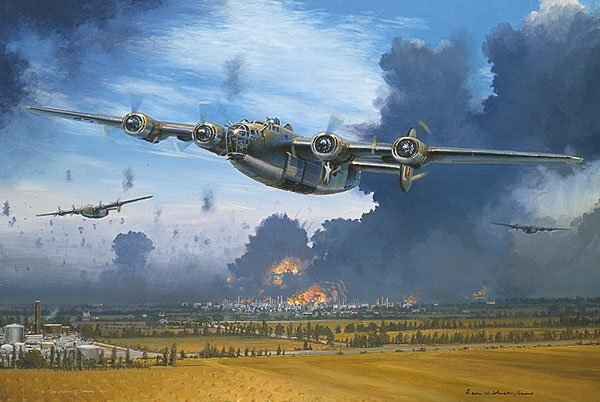 The Ploesti Raid was one of the most famous and difficult raids of World War II and Bill has depicted the fire and the fury that those B-24 Liberator pilots faced as they bombed the oil fields of Ploesti. supplied approximately one third of all the Nazis' fuel oil, therefore became more than just a military target. A raid on Ploesti became a way to strike at Hitler himself. "On the first day of August, 1943, then-Colonel Leon Johnson's aircraft, a B-24D, of the 67th bomb squadron, 44th bomb group, flew over target Ploesti, code-named 'Tidal Wave,'" says aviation artist William S. Phillips. "For his action that day, Colonel Johnson received the Medal of Honor." In all, 179 B-24 Liberators of the American 9th Air Force took off that day on "Operation Soapsuds" to pound the Ploesti installations. The results were promising but the price was high. The Americans lost fifty-three aircraft in the attack but the door was then open for subsequent bombings which yielded higher dividends. Within six months, the amount of oil that Germany was taking from Rumania was cut by eighty percent. "What interested me from an art standpoint was that they went in low-level," says Phillips. "This raid took place right on the ground. It's the kind of thing that lends itself well to the kind of work I do. The sun is high in the blue sky and Johnson's B-24D is coming right at you." Phillips' appreciation of Johnson's accomplishment is shown in this limited edition fine art print, made from the original that was signed by Johnson himself.